The Leap Blog: What happened to global food prices? Hypothesis: The spike in world food prices is caused by increased demand in China and India, particularly the shift towards consumption of meat as people get richer. 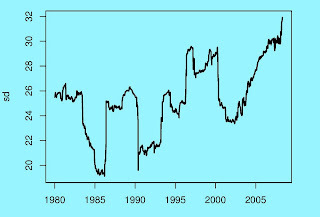 My problem with this explanation is that it doesn't explain why the price index for major food crops was stable at 100 from 1990 till 2005, and spiked thereafter. China and India had a massive transformation of incomes and the structure of the food basket from 1990 to 2005. The bulk of trading on futures markets is speculative: but for every buyer on a futures market there's an equal and opposite seller (by definition). A bigger futures open interest has no net effect on prices. More generally, futures markets have been around for over a century and grown steadily over the 1990-2008 period: it's hard to blame them for the spike in prices starting in 2005. Yes, there's a new phenomenon of commodity funds and hedge funds trading in commodities. But these numbers are just tiny when compared with the global agricultural trade. And if they had held a lot of inventory, it would have shown up in the inventory series above - but total global inventories went down and not up. Here's one phenomenon which could play a role in deciphering what happened. Suppose, for a moment, that a commodity is not storable. And, we know that given the lags between sowing and harvest, in the short term, a price innovation can induce no supply response. When an imbalance between supply and demand arises, prices move to clear the imbalance. How far do prices have to move? Prices have to move as much as is needed for demand to get crimped, so as to equalise supply and demand. Now consider a product such as wheat. When there is an upward shock to the price of wheat, rich people just do not reduce their consumption. A naan or a baguette that weighs 0.1 kg has an embedded cost of wheat of USD 0.04 or Rs.1.6 (assuming wheat is at $400/MT). When an affluent person buys or makes a baguette or a naan, a very large change in the price of wheat generates no change in consumption. A 50% change in the price of wheat sounds like a lot: but it drives up the embedded wheat cost in the baguette/naan by USD 0.02 or Rs.0.8 - this would be insignificant for affluent people. Their demand is inelastic. When demand is bigger than supply for a nonstorable commodity with zero short-term supply elasticity, prices would rise as much as is needed to close the gap. Demand can only shrink when some people get pinched and ease up on consumption. These are the poor. Poor people are the shock absorber that stabilise prices for non-storable agricultural commodities. The first would akin to 19th century Ireland, with poor people primarily eating wheat, and we can get odd effects. We could get such behaviour today with the really poor. In 1985, I happened to be an honoured guest at a hamlet in Western Maharashtra. The lunch they served me was: flat bread made of coarse grain. That's it. There was nothing else, just powdered red chili for flavour. The second case is a person who's rich enough to eat some meat, but would cut back on meat when it got expensive. This kind of person generates high price elasticity of demand for grain because of the 2:1 or 8:1 ratios between meat and grain, which imply that for each 1 kg of meat that he backs away from, 2 or 8 kg of grain is freed up. Hence, in the early stages of food-feed conflict, when people have started dabbling with meat but aren't yet price insensitive about it, the price elasticity of wheat demand goes up sharply. The third case is a person who is rich enough to eat meat and is price insensitive about it. A buildup of more people in this third case reduces price elasticity of demand. My story is about a world where there are very few people in the 1st case, and an increasing transition from the 2nd case to the 3rd case. GDP growth yields fewer poor people who respond to higher wheat prices by purchasing less meat or wheat, i.e. we have less of a shock absorber. That generates a reduced elasticity of demand of wheat. So prices have to rise by more in order to clear a supply-demand imbalance than was required in the past when there were more poor people who would adjust. In the bad old days, people in China and India supplied the world with a large shock absorber, a large mass of poor people who tightened their belts when prices rose. This gave higher global demand elasticity and reduced price volatility. From the late 1970s, economic reforms in China and India have given greater affluence and thus diminished this shock absorber. This does seem to show a longer term phenomenon of increasing vol. Now let's bring in speculators and storage. Suppose commodity volatility went up in this fashion when affluence increased. This should generate increased profitability for the speculative strategy of holding inventories of food and opportunistically waiting for the next great price flare-up. Call this hoarding or call it buffer stocks: the bottom line is that large inventories stabilise prices. The cost of holding in recent years was unusually low given the low interest rates. (As an aside, the direction of effects here runs opposite to what Jeffrey Frankel has been talking about). But the data shows that hoarding didn't go up; on the contrary inventories have dropped from 2000 onwards. The puzzle is : why is there so little speculation? Why did speculators in 2000-2005 do so little hoarding? Hoarding would have smoothed out prices: purchases in 2000-2005 would have given higher prices then and sale in 2008 would have given lower prices today. To buy 10 million tonnes of wheat in 2005 and hold requires a bit of capital. At USD 300/MT, this would require putting down $3 billion plus a flow of storage costs. Who were the kinds of players who were setup to evaluate such a trade? What kinds of leverage was available to them, to juice up their return on equity? I don't know enough about the field: was there an abundance of such players and did they have enough leverage? Were we hitting limits of arbitrage? Was insufficient capital being put into these speculative strategies for some reasons that are linked up to the institutional structures of finance? I am reminded of the difficulties of uncovered interest parity (UIP) on the currency markets. The `carry trade' is an equilibriating response; it would tend to make UIP work. Perhaps too little capital is put into the carry trade relative to the massive size of the currency market, thus generating violations of UIP. Is a similar phenomenon going on here? Perhaps the massive pools of financial capital that are able to hold large inventories (a.k.a. buffer stocks) weren't being deployed into commodities on a scale required to have inventories that are large enough to stabilise the global food market. If so, the solution would involve more capital with commodity funds and hedge funds that trade in commodities. Perhaps what happened was like this. There was a string of supply shocks - things like ten consecutive droughts in Australia, a small switch towards biofuels. If these shocks were anticipated in 2000-2005, then this points to institutional failures where the financial / commodity firms were not able to galvanise themselves to do enough hoarding. Alternatively, if these shocks were not anticipated in 2000-2005, then the future outlook had to be benign, which led to a rational drawdown of inventory, i.e. low buffer stocks, in the hands of the speculators. Prosperity had risen over the years, giving unusually inelastic demand -- the consumers of China and India who have long contributed to elasticity of global demand by tightening their belts were less poor and less willing to tighten their belts. With fewer people willing to adjust, prices had to move a lot to clear supply and demand. I am optimistic about what the future holds. High prices have a way of inducing far-reaching supply responses on the medium term and long term. We have been surprised, again and again in the past, at the cleverness with which producers responded to higher prices by producing more. When the Hunt brothers tried to corner the world market for silver, they were astounded at the quantities of silver that were brought into the market by way of a response to higher prices. High prices of petroleum products increases the use of camels in transportation. In similar fashion, high wheat prices can even make Afghan poppy farmers switch to growing wheat! Vast tracts of land in Russia and India have low yields: High prices will give incentives to entrepreneurs to find ways to use this land better. Over the coming two years, a large supply response could come about. Something big might already be afoot: an 8.2% rise in world wheat output is projected for 2008-09, and surely some of it has to do with the incentives put out by high prices. These events seem to have helped reduce the informational and institutional gap between finance and commodities. A greater convergence between the financial world and the commodities world, through new structures such as commodity funds or hedge funds that deal in commodities, would bring resources commensurate with the size of these markets into play. You choose whether you want to call this stabilisation, hoarding, speculation or buffer stocks. You base your arguments about the lack of speculation on the stored capacity of food. However, one of the ways to speculate or 'hoard' food is to not produce it at all. That is produce less in a year so that you can produce more next year. Statistics tell us that the acerage of food has gone down. Now, I don't know the extent to which you can produce less in one year to produce more next year. But there is a feeling that this is part of why it is going on. That's really interesting. A question for you, does all futures contracts register as inventories in the chart? or is what annon here suggested a possibility? Anon, your scenario won't really work for price takers like, say, wheat farmers. One is likely to switch crop based on future direction of crop price - say, corn instead wheat to be used in ethanol rather than to hoard by producing less. Really thought provoking.. However, not sure if there is neccesary a co-relation between speculation and food inventories. Futures contracts can be "cash-settled", can't they? (Or are global food-futures markets delivery only?) In a cash-settled contract, the futures seller need not have underlying wheat stock. Speculative ability would then require capital inventory rather than food inventory. Nice model. However, I question the extent to which people have reached the price insensitive category. The number of extremely poor is declining fairly rapidly, and all of those people are now moderately poor. It seems to me that this group should now provide more price elasticity than earlier. In comparison, it's much harder to move into the category where price fluctuations really don't matter. Even in the US, I believe many people are probably eating less meat due to higher food prices. Thanks for the interesting post. I would like to add a slightly different story about the source of current price increases that emerges from analyses by the International Food Policy Research Institute (http://www.ifpri.org/). The combination of new and ongoing forces is driving the world food situation and, in turn, the prices of food commodities. One emerging factor behind rising food prices is the high price of energy. Energy and agricultural prices have become increasingly intertwined. With oil prices at an all-time high of more than US$100 a barrel and the U.S. government subsidizing farmers to grow crops for energy, U.S. farmers have massively shifted their cultivation toward biofuel feedstocks, especially maize, often at the expense of soybean and wheat cultivation. About 30 percent of U.S. maize production will go into ethanol in 2008 rather than into world food and feed markets. High energy prices have also made agricultural production more expensive by raising the cost of mechanical cultivation, inputs like fertilizers and pesticides, and transportation of inputs and outputs. At the same time, the growing world population is demanding more and different kinds of food. Rapid economic growth in many developing countries has pushed up consumers' purchasing power, generated rising demand for food, and shifted food demand away from traditional staples and toward higher-value foods like meat and milk. This dietary shift is leading to increased demand for grains used to feed livestock. 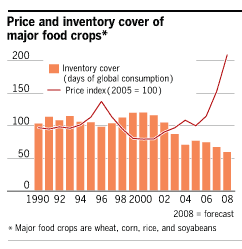 Poor weather and speculative capital have also played a role in the rise of food prices. Severe drought in Australia, one of the world's largest wheat producers, has cut into global wheat production. I believe much of what was written is correct. However, there are a few other issues afoot that push "hopeful" to a whole new level. The US is STILL paying farmers to NOT plant. We are also paying ethanol producers subsidies to turn corn into a useless fuel. Should the US suddenly eliminate both subsidies, the prices of foodstuffs would drop precipitously as cattle feed would be suddenly widely available, unused land was suddenly planted, and the deficit suddenly reduced (helping to keep interest rates lower). The US government is doing much to create this undersupply and fueling the speculators who are making much use of the arbitrage. In addition, speculators have been keenly aware of the weakening US dollar, and the value this puts on exporting US foods to other nations. Rice is becoming less and less a staple food in Asia as wheat products become more widely available....due to a weak dollar and plenty of US foods to ship. This puts plenty of upward price pressure on food stocks. I think the analysis is excellent, and with some minor tweaking to account for things like subsidies and the weak dollar, it makes much more sense. Speculators are NOT the only player in the market, and I happen to believe speculators even out prices over time, reducing spike impacts. However, when there is a vast reduction in supplies, and pressure to keep those supplies low (subsidies) in light of increased demand, speculators get to play the arbitrage game with the weak dollar. So they do have some role. I find it interesting that in most discussions of this type, the subject of population growth rate in a finite world is seldom included. The driving forces are population growth and people getting richer (thanks for an excellent analysis on the elasticity as a function of wealth) and sooner or later finite land area and water supply will create a supply demand problem where minor supply issues can decrease price stability. There is a photosynthetic efficiency limit that scientists can't get us past. You can't violate the laws of thermodynamics. This limits the yields per hectare. Rising food grain problem is not to for this current year. It will become more severe in the coming years. So government should take some steps which will benefit India farmers and also the world economy. As the prices of the food grain is growing because of the gap between demand and supply. Government should take necessary measures to provide farmers with adequate loans and equipments and encourage them for farming. As most of the farmers are selling there land to private builders for the better short term gain. If the price on which government procure grains is increased every year as per international market standards. Than I think it will encourage more and more farmers to opt for growing food grain rather than selling there land to builders. Government should take some strong actions on this issue at this moment itself, so that it can make India developed state for agriculture related products. what a great analysis, and very enjoyable too! My name is Daniel Limon and i'm represnting India in the Israel and Middle East Modle UN. If anyone could help me I would like to know more about Indias policies on rising food prices. Alternatively, if these shocks were not anticipated in 2000-2005, then the future outlook had to be benign, which led to a rational drawdown of inventory,.. I have to thank you such an article.